A quick background on myself. At the time of this harvest, I was a 31 yearr old father of 2 boys who did everything with me. I had been archery hunting for 17 years. Up until this time, I had never had the opportunity arise to harvest a mature deer while archery hunting throughout all of those years. In 2011, an offer was extended to me to start hunting a co-workers' small property, and I gladly accepted. That season was a bust as I started late, and truly was unable to learn much of the lay of the land, and deer habits. This brings us to the fall of 2012. On a whim, I decided to grab my then six year old son immediately after the school day, and head to one of our double stands on this property. As is often the case, it was a very mild fall afternoon. I remember arriving and thinking that I might as well leave the bow in the car with a temperature of 72 degrees. As my son and I departed the car, bow in hand, I decided that this would simply be a learning day for him. We would simply sit and watch nature, and learn what we could with each passing opportunity. We settled in at about 3:45 pm and began watching the birds. My son had brought his binoculars, and was taking everything in. It was at 5:15 pm that everything changed. Out of the corner of my eye I had caught movement off to my right about 90 yards out. I placed my hand on my son's knee, and that was all the prompting he needed. He immediately froze, and squinted his eyes as I had told him I do as a deer is approaching. I was able to gather that this deer did infact have anters, and after 17 years of waiting, I honestly didn't care. I was always taught look once and don't look again, and I did. I only got a profile shot, and knew there were horns, not alot, but some. Sure enough, as I rolled over on my cam, he hits the tube once, loud and short. Then ever so quietly whispers, "Deep breath daddy." As my pin settled onto his chest, my finger ever so naturally swept across my trigger, and away my arrow went. Sailing dead on, it passed clean through the chest of this deer, and he lurched as if excited. He took maybe ten steps and from behind me I heard, "Daddy, Daddy! You know that funny walk they do on TV before they fall over?... Nevermind, he fell over." Seventeen years I waited to harvest my first archery deer. Seventeen years I waited to harvest my first buck. Seventeen years, I waited so that I could share this moment with one of the two most important people in my life. Seventen years... was well worth the wait. I dialed my phone as the tears flowed down my face with my son in my arms. The call was to my father. "Dad, your grandson just watched me shoot my first deer with a bow, that also happens to be my first buck!!" All that was said from the other end of the phone was, "I'm on my way son." My father left his hot meal that he had just set down to at the table and told my mom that he would be a few hours with myself and my son bringing home my deer. It's a 35 minute ride from my parents to this property, so I decided that we should go look. As we neared him, he did not have any ground shrinkage. Quite the contrary. I stood above an absolute slob of a 7-point with a 23 1/2" inside spread, and a body that would rival a mid 70's VW Beetle. Tears, again. My dad arrived, and drove down to me, and as he got out he simply shook his head in amazement at the sheer mass of this deer. After a quick field dressing assisted by headlights, we hefted him up into the bed of the truck. We quickly headed for home, and took a few pictures before I took him to my buddies meat shop to hang, skin and slide into the cooler. He dressed at 218 lbs, aged at 6 1/2 years, and made into some seriously delicious summer and breakfast sausage. 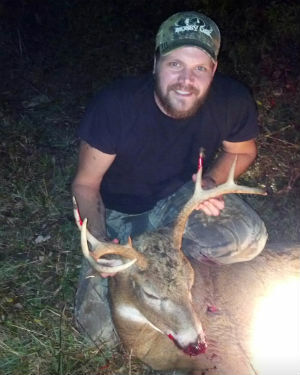 My first ever archery deer truly was my hunt of a lifetime, and if I had to do it all over again, I'd wait another 17 years to re-live that moment. A truly blessed outdoorsman is what I became that day.